At ITEXPO Fonax today announced the release of their minimalist WEB UI with full recording capability. As of Feb 2nd all Fonax systems will ship with the new interface and capabilities. The new user interface enables installers and end-users, the ability to make simple, as well as complex changes to their phone system. Adding users, extensions, call reports and much more are now as simple as a few clicks away. To be honest I've never heard of Fonax. However, they claim that Fonax is "South America's fastest-growing business communications company, and a leading provider of VoIP phone and Technology Communications solutions for small and mid-sized businesses." Fonax was founded in 2004, Fonax-Vivophone has over 250,000 user installed base. 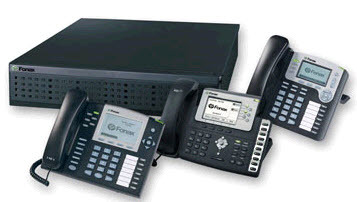 Interestingly, their name reminded me of Fonality and when I checked out Fonax's website I see they offer a hosted-hybrid PBX system, which Fonality was one of the first companies to do this. They also offer presence management, and integration with products, such as Vtiger, SugarCRM, which Fonality also does. Not sure what sort of presence management application Fonax uses. I couldn't find a screenshot Fonality uses their popular HUD 3.0 Java-based application. Made me wonder if Fonax was a spinoff of Fonality, while Fonality is a spinoff of trixbox/Asterisk. Fonality offers trixbox PRO and Fonax offers Fonax PRO - both caps on the word "PRO" too. Since Fonax was founded in 2004 and Fonality in 2005, perhaps the reverse is true and Fonality copied Fonax? Or it can just be that great minds think alike! I'll have to check out Fonax's lines of IP-PBXs on the ITEXPO show floor when it opens. I'll get some more background on them and maybe even schedule a review of their system. Seems pretty interesting.